Build traditional skills while you craft beautiful, high-quaility objects in the smithy of Wrought Academy! Our courses for the Spring of 2018 take on a range of subjects from beginning blacksmithing to Viking age axes and silver arm rings. Private Instruction is now offered at Wrought Academy. 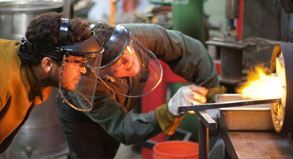 In this relatively quiet and highly focused setting the student gets the full attention of the instructor while concentrating on a personal project arranged with James Austin. If you would like to take advantage of one-on-one tutoring please contact James at hotsteel@sbcglobal.net . Please see the description HERE. DATE: January 13th and 14th, 2018, from 10am to 6pm. LEVEL: Beginning, Maximum Class Size - 6 people. DATE: January 20th and 21th, 2018, from 10am to 6pm. DATE: January 27th and 28th, 2018, from 10am to 6pm. LEVEL: Beginning + Intermediate, Maximum Class Size - 6 people. DATE: February 23rd and 25th, 2018, from 10am to 6pm. DATE: March 3rd and 4th, 2018, from 10am to 6pm. DATE: March 9rd, 10th and 11th, 2018, from 10am to 6pm. DATE: March 31st and April 1st, 2018, from 10am to 5pm. LEVEL: Intermediate, Maximum Class Size - 6 People. DATE: April 6th, 7th and 8th 2018, from 10am to 6pm. DATE: April 21st and 22nd 2018, from 10am to 6pm.